In 1961, U.S. advisors in South Vietnam, along with the Diem regime, began the implementation of a plan attempted to isolate rural peasants from contact with and influence by the National Liberation Front (NLF). The Strategic Hamlet Program, along with its predecessor, the Rural Community Development Program, played an important role in the shaping of events in South Vietnam during the late 1950s and early 1960s. Both of these programs attempted to separate rural peasants from Communist insurgents by creating "fortified villages". The program backfired drastically and ultimately led to a decrease in support for Diem’s regime and an increase in sympathy for Communist efforts. In late 1961, President Kennedy sent Roger Hilsman, then director of the State Department's Bureau of Intelligence and Research, to assess the situation in Vietnam firsthand. 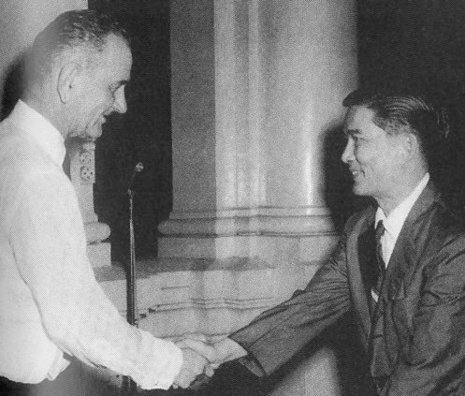 There Hilsman met Sir Robert Thompson, head of the British Advisory Mission to South Vietnam and a veteran of the Malayan counter-insurgency effort. The two discussed counter-insurgency doctrine and Thompson shared his revised system of resettlement and population security, a system he proposed to Diem later in the year and that would eventually become the Strategic Hamlet Program. In Vietnam, strategic hamlets would consist of villages consolidated and reshaped to create a defensible perimeter. The peasants themselves would be given weapons and trained in self-defense. Moreover, the strategic hamlets would not be isolated; instead, they would function as a network. The first hamlets would be placed in secure areas, free of the enemy; new hamlets would then be added slowly to create a secure, expanding frontier in what was known as the “oil blot” principle. But, Thompson said, it was important that the strategic hamlets provide more than just physical security. The hamlets should be used as an administrative tool to institute reforms and to improve the peasants’ lives economically, politically, socially, and culturally. This would strengthen the tie between the peasants and the central government. Hilsman later summarized this theory of the Strategic Hamlet Program in a policy document entitled "A Strategic Concept for South Vietnam," which President Kennedy read and endorsed. The Strategic Hamlet Program was exposed as an almost complete failure in the aftermath of the November 1, 1963 coup that left Diem and his brother Nhu murdered. US officials discovered, for example, that only 20% of the 8600 hamlets that the Diem regime had reported "Complete" met the minimum American standards of security and readiness. The situation had passed the point of possible recovery. The U.S. government never officially acknowledged the end of the Strategic Hamlet Program, but it quickly disappeared from diplomatic correspondence in early 1964.